The Supreme Court’s often times swing vote justice, Anthony Kennedy, has had a new stent put into a coronary artery. 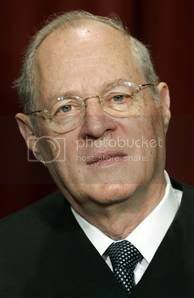 Supreme Court Justice Anthony Kennedy was hospitalized over the weekend after experiencing mild chest pain, the court said Tuesday. Kennedy, 70, had a stent inserted Saturday at Washington Hospital Center. The device is a tiny mesh scaffold used to keep arteries open. HeartSite puts up a great page – with cool flash animations – on just how a stent works. Like angioplasty, coronary stents physically opens the channel of diseased arterial segments, relieves the recurrence of chest pain, increases the quality of life and reduces other complications of the disease. Since it is performed through a little needle hole in the groin (or sometimes the arm) it is much less invasive than surgery and can be treated with another needle or percutaneous procedure should the patient develop disease in the same, or another, artery in the future. How is Coronary Artery Stenting performed? Prior to performing stenting, the location and type of blockage plus the shape and size the coronary arteries have to be defined. This helps the cardiologist decide whether it is appropriate to proceed with angioplasty or to consider other treatment options such angioplasty, atherectomy, medications or surgery. Cardiac catheterization (cath) is a specialized study of the heart during which a catheter or thin hollow flexible tube is inserted into the artery of the groin or arm. Under x-ray visualization, the tip of the catheter is guided to the heart. Pressures are measured and an x-ray angiogram (angio) or movie of the heart and blood vessels is obtained while an iodine- containing colorless “dye” or contrast material is injected into the artery through a catheter. The iodinated solution blocks the passage of x-rays and causes the coronary arteries to be visualized in the angios. In other words, coronary arteries are not ordinarily visible on x-ray film. However, they can be made temporarily seem by filling them with a contrast solution that blocks x-ray.